Finally, the card in the D slot increases the value of one animal. You (and only you!) immidiately score one point per animal of the type you moved up on the scale. If you don't have an animal of that tpe you don't get any points. 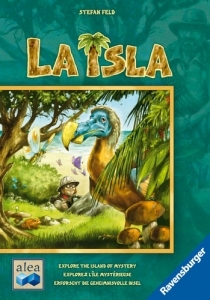 Each animal has a points threshold so that if you move an animal up, say, four times, each animal of this type is worth an extra point at the end of the game. The scale goes up to five so that every animal can be worth up five points at the end of the game. When the sum of these values for all five animals equals seven, nine or eleven (based on the number of players), the game ends at the conclusion of the round. Players then tally their final scores to see who wins. 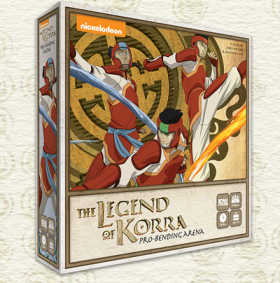 Based on the fan-favorite Nickelodeon animated series, The Legend of Korra: Pro-Bending Arena is a two-player competition of wits, tricks, and speed as players take control of Republic City's favorite sport. Focusing on the rivalry between the Future Industries Fire Ferrets and The White Falls Wolfbats, The Legend of Korra: Pro-Bending Arena has two players each taking control of a team, drafting card decks for their benders, then playing cards to place elemental tokens around the board in an effort to overwhelm their opponent. As in the show, pro-bending matches are a game of push and pull, with an objective toward being the team that has either advanced the farthest forward, or completely knocked their competitors out of the ring. The game play of The Legend of Korra: Pro-bending Arena is closely modeled after the popular Pro-bending sport featured in the first season of Avatar: The Legend of Korra. As such, the game is designed for 2 players, each controlling a team of 3 benders: earth, fire, and water. The objective of the game is simple: be on the other team's side of the arena when the game ends and you will be victorious, or dominate the competition, pushing all their benders off the back of the arena to end the game immediately and claim the championship as yours! 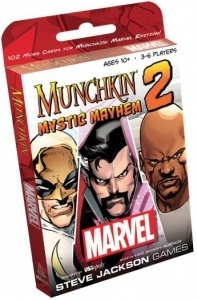 Munchkin Marvel 2: Mystic Mayhem, an expansion for Munchkin Marvel, lets players journey into mystery with Doctor Strange and The Defenders as they fight villains like the evil Baron Mordo and the Dread Dormammu. This expansion includes new Doors and Treasures as well as twelve oversized Dungeon cards that introduce powerful new threats and Allies and add a new level of mayhem and madness to the game.